ACTIV@WORK CHALLENGE 2018 JOIN NOW! 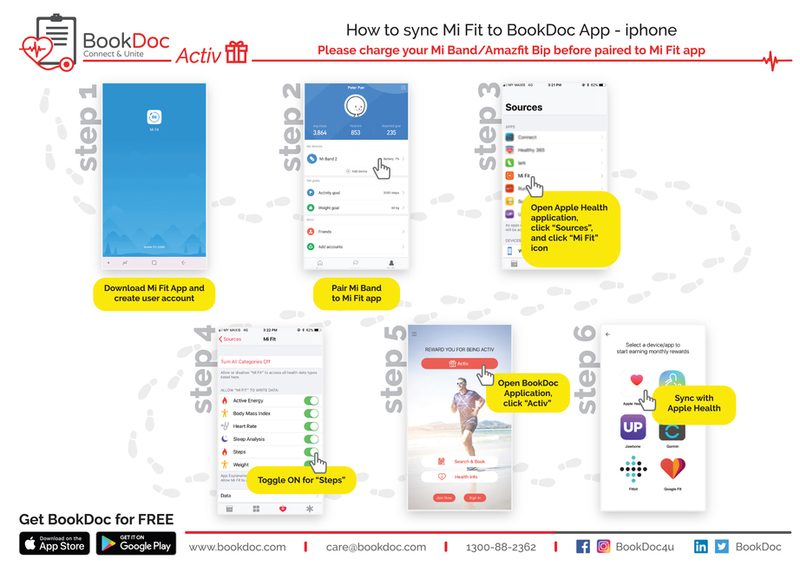 Sync your fitness tracker with BookDoc Activ, and begin your rewarding journey for being Activ! Your average daily number of steps at the end of every month will become your Reward level: Bronze, Silver, Gold & Platinum, where exciting deals await. The higher the Reward level, the better the deals and the greater the number of lifestyle verticals which you could take advantage of. Check out the comprehensive list of Reward partners and the countries where you could enjoy the benefits. It includes participating outlets under food & beverages, grocery shopping, gym & fitness, clothing & apparel, health & wellness appliance, transport and many more. Available at App Store and Google Play. Physical inactivity is one of the leading risk factors for death worldwide. It is a key risk factor for noncommunicable diseases (NCDs) such as cardiovascular diseases, cancer and diabetes. Physical activity is essential for good health. Workplaces can help increase physical activity levels, and thus improve the health of employees, reduce sickness absence and increase productivity. A new initiative by PERKESO in collaboration with BookDoc, Activ@Work aims to encourage employers to help their employees to stay active wherever they may be at even at the workplace! Using the concept of being active while collecting rewards, this program can make physical activity an interesting activity to do. This is the 3-month challenge starting from 1st September to 30th November 2018. Participating employers will delegate their own workers as participants (number of participants according to category). Each participant will use BookDocActiv mobile app to monitor participants’ step count. During the 3-month challenge, make sure your participants reach the targeted step count to earn points! Collect as many points as possible to be the Most Active Employers! In addition, participants will also be rewarded individually through the app. Collect as many points as possible throughout the challenge and be the winner! Please feel free to refer to our FAQ for further inquiries. Participation is open to all employers nationwide for free. Participating employers must be the registered employers under PERKESO. Registration shall be made by company and you shall provide the PERKESO employer code upon registering. You will be offered trial period until 31st August 2018 to get used to the app. Participating employers will gain points if their workers reach the desired target (i.e. bronze, silver, gold, or platinum) throughout the 3-month challenge. The more participants an employer can gather, the more points the employer can potentially gain. Collect as many points as possible to be the winner! Participating employers are open to select any desired category according to the number of participants. Top 3 Most Active Employers (based on total points collected) will be chosen for the category of Large, Medium and Small. Self examination set for workplace. The right to use Activ@Work 2018 Most Active Employer logo in company's marketing collateral. Throughout the challenge, each individual participant can redeem rewards within BookDoc app every month as long as they achieve the target (i.e. bronze, silver, gold or platinum). Select 'Activ', synchronize with activity tracker, and start walking. For Mi Fit user, you may refer to the user guide (iOS | Android) for the steps. Do contact our technical support team if you need further assistance. For Google Fit user, please use the account associated with Google Fit. View steps here. Can I register as an individual? No, this competition is for company only and one of the requirements for registration is to provide PERKESO Employer Code. Nevertheless you may suggest your company to join this competition. I have registered my company for the competition. What is the next step? Thank you for your participation. PERKESO will contact you (via email) soon and give you the 'welcome package' which will guide you on how to proceed with the challenge, followed by sending the physical posters and flyers to your office. Next, encourage your staffs to join the challenge and start moving! I participated in Activ@Work 2017; do I still need to create a new BookDoc user account for Activ@Work 2018? No need, you may still sign in using the same login credentials created previously. If you forget the password, you may click on the "Forgot your password ?" link and follow the instructions to reset a new password. Once you have signed in, don't forget to enter the new promo code assigned to your company for Activ@Work 2018. Should you require any assistance, you may contact BookDoc at 1-300-88-2362 (Mon-Fri: 9am-6pm, Sat: 9am-1pm) or activatwork@bookdoc.com. I own a small company and only have 20 staffs with me. Can I join the competition? Yes, you can. Your company will be classified under the Micro category. How are the points counted? How are you able to identify my company's staff? Every company who register for the competition will get a unique promo code. This promo code is to be entered on BookDoc app. We can then identify your staff by this promo code. My company has more than 500 staffs. Can all of them join the competition? Yes, definitely. However, we will only count the points based on the highest 250 staffs, referring to the steps that have been collected individually. How can I monitor my company's ranking? There will be leaderboard published on the Activ@Work website, and the ranking will be updated on a bi-weekly basis. Where do I get the promo code? PERKESO will send over the promo code together with the 'Welcome package' to your persons in charge. You may check with them for more details. Why do I need to enter the promo code? The promo code is intended to differentiate the participants from different competing companies. Besides, this promo code allows you to enjoy a premium membership from BookDoc for 5 months. BookDoc normal user can only claim 5 rewards each month, but with the premium membership user can claim up to 20 rewards as long as they achieve at least Bronze tier each month. If my company participates in this competition, will my staffs also have a chance to win as well? Yes, the employees will be competing for the top 10 "Most Activ Workers" within each category. My company is interested to join this competition but it's already past the competition start date. Can we still join the competition? Yes, you can still register and participate in the competition. The points will be calculated from the day your employees enter the promo code. What do I need before using BookDoc Activ? Wearable Fitness Devices Fitbit, Garmin, Mi Fit App Ensure their software requirements are compatible to your smartphone. Fitness App (downloadable for free) Health (Apple), Samsung Health (Samsung), Google Fit (Other Android). Your smart phone must come with motion-tracking sensor. How do I join BookDoc Activ? Download "BookDoc" app for FREE on the App Store or Google Play. 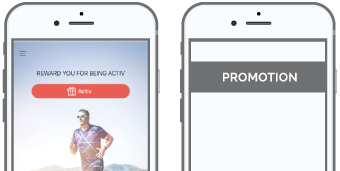 Click the "Activ" button on the landing page and follow the instructions to sync to a fitness tracker/app. What should I do if I forgot my password, sign in detail and wish to amend my profile? If you forget the password, you can always click on the "Forget Password" link at Sign In page. Should you require any assistance, please contact us at activatwork@bookdoc.com or 1300-88-2362 (Mon-Fri: 9am-6pm, Sat: 9am-1pm). Why do I need to verify phone number? Verifying phone number allows you to view the in-app rewards. We will also be able to contact you via the verified number should you require any technical support. I'm concerned about my privacy. What are the information that BookDoc collect while tracking my steps? How do I participate in Activ@Work 2018 representing my company? You can participate by entering the promo code assigned to your company on the "Promotion" page within BookDoc app. How do I get the promo code? Please check with the person in charge in your company. Why do I get an error message when entering the promo code? Please ensure that the promo code entered is correct; it is also case sensitive and cannot contain any space/special characters. Should you require any assistance, please contact us at activatwork@bookdoc.com or 1300-88-2362 (Mon-Fri: 9am-6pm, Sat: 9am-1pm). Do I have to open BookDoc app all the time? No. As long as you don't sign out, your device will automatically sync with BookDoc Activ. If you are signed out, your steps data might not be captured properly and thus affecting your point contribution to the company as well as your monthly tier. My steps data do not seem to sync properly with BookDoc app. What should I do? Please make sure you have a compatible smart phone and compatible fitness tracker/app. Should you require any assistance, please contact us at activatwork@bookdoc.com or 1300-88-2362 (Mon-Fri: 9am-6pm, Sat: 9am-1pm). How much battery life does BookDoc app consume? Minimal; this is because we don't require you to open BookDoc app all the time to capture your steps data. You just need to make sure that you don't sign out from the app. What should I do if I have been signed out from the app? Click on menu bar on top left and click "Sign In". If you previously registered the user account with email, you just need to re-enter the same email followed by password to sign in. If you previously signed in using your Facebook credentials, just click the "Sign in with Facebook" button. Does BookDoc app consume a lot of data? Minimal; this is because we don't transmit data continuously at the background. Will my steps data be captured properly if I don't turn on mobile data or if I travel overseas? Minimal because we don't transmit real-time data. The steps data will continue to capture if I don't turn on mobile data or in oversea? 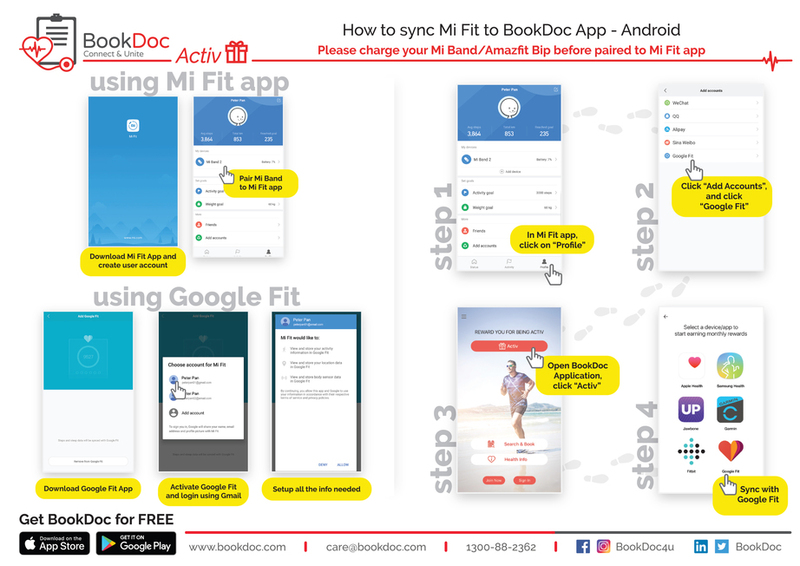 No; although your phone / fitness tracker will capture your steps even without internet access, you will still need minimum internet connection to update the steps data on BookDoc app. Why does BookDoc Activ still show 0 steps after I have synced with a fitness app/tracker? 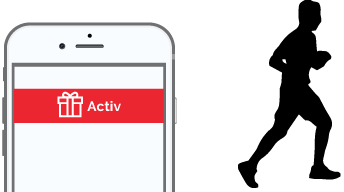 For Apple Health: Each time when you open BookDoc app, the syncing animation will appear next to the Activ button on the landing page. Please ensure that you allow the syncing animation to finish before you close the app. Otherwise, due to security reasons on iPhone the app might not fully capture all your steps data. 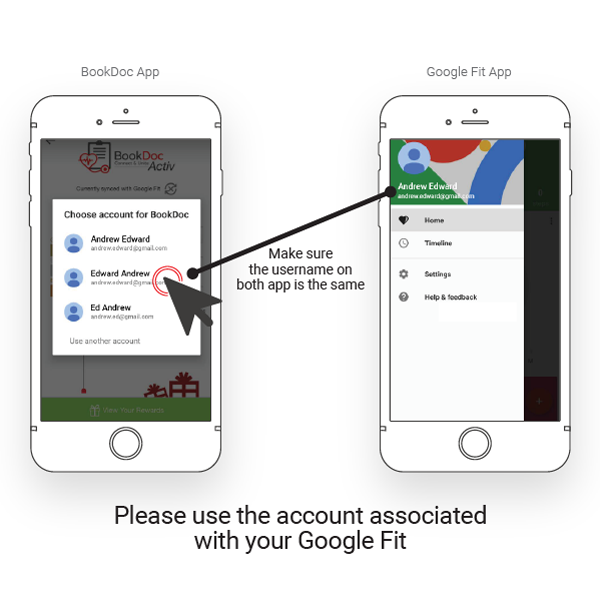 For Google Fit: Sometimes there is a delay in the transmission of data from Google Fit to BookDoc app. Nonetheless, the sync is continuous and therefore the full steps data will be transmitted after some time. For fitness tracker e.g. Fitbit or Garmin, please remember to turn on Bluetooth on your phone so that the steps data on your fitness tracker can be transmitted to its respective app. Should you require any assistance, please contact us at activatwork@bookdoc.com or 1300-88-2362 (Mon-Fri: 9am-6pm, Sat: 9am-1pm). What is BookDoc Activ Membership Tier? How do I achieve and maintain Platinum Tier? In order to achieve Platinum Tier, you will need to maintain Gold Tier for 3 consecutive months whereby to achieve Gold Tier you need to maintain Average Daily Steps of at least 10,000 for each month. For example, if you achieve Gold Tier for Month 1 & 2, by Month 3 if you can still maintain 10,000 Average Daily Steps, you will unlock the Platinum Tier by the end of Month 3. To maintain the Platinum Tier, you will also need to maintain the 10,000 Average Daily Steps every subsequent month. If somehow you only achieve 7,000 Average Daily Steps on a particular month, your Tier will then become Silver. Subsequently you will need to repeat 3 consecutive months of Gold Tier again before unlocking Platinum. What are the rewards I get to enjoy by achieving the Membership Tiers? 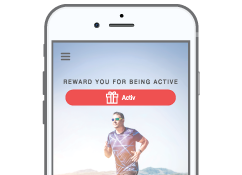 The list of rewards is updated from time to time; you may refer to the latest available rewards by clicking "View Rewards" on the Activ page. When can I claim the rewards? You will receive notification on the 1st day of the month based on the Membership Tier you achieved on the previous month. If you achieved at least Bronze Tier, you may claim the corresponding rewards in the form of e-voucher within the first 7 days of the month. The claimed e-vouchers will generally stay in the app for 30 days during which you may redeem from the merchants via online or physical outlets, depending on the Terms & Conditions. What will happen if I miss the claiming cycle for the rewards? You may try again on the following months as the reward claiming cycle repeats every month. What should I do if I am unable to redeem the reward from the merchant? Please contact us at activatwork@bookdoc.com or 1300-88-2362 (Mon-Fri: 9am-6pm, Sat: 9am-1pm) with as much details as possible. Aside from Activ, what other benefits does BookDoc app offer? There are 2 other useful functions that you may find on the app's landing page, namely Search & Book and Health Info. 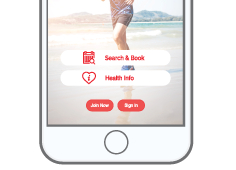 BookDoc Search & Book is a discovery platform for healthcare providers whereby users can search for healthcare providers by distance and availability. Besides online appointment feature, the Search & Book also integrates seamlessly with navigation & ride hailing apps, accommodation booking services as well as restaurants & attractions guide so that users can have a hassle free healthcare journey. BookDoc Health Info is regularly updated with the latest health articles and tips curated by MIMS. By submiting this, I acknowledge to be the authorized representative of my employer and that I have obtained the permission to register on behalf of my employer. I confirm that the registration does not breach or conflict with any of my employer's internal policies. Once registration is confirmed, our team will contact you for set up of the challenge. You will be required to delegate your own workers to be the participants (number of participant according to desired category). Trial period will be given until 31st August 2018 to get used to the app and get ready for the real challenge!